Electromatic Pro Jet models take on a unique voice and identity—chambered basswood bodies and arched maple tops along with dual Black Top Filter’Tron humbucking pickups resonate true to That Great Gretsch Sound. 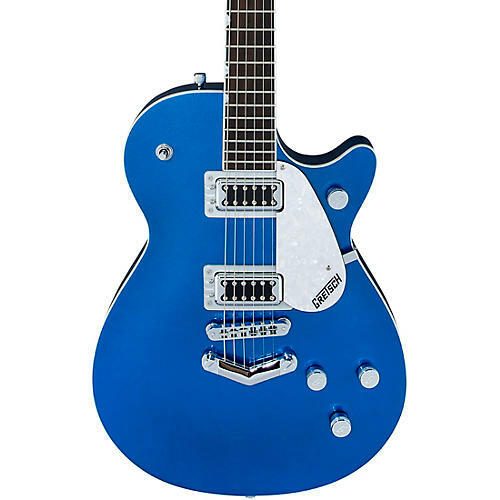 The G5435 Limited Edition Electromatic Pro Jet is available in a brilliant Fairlane Blue finish and features a rosewood fingerboard with 22 medium jumbo frets and pearloid Neo-Classic thumbnail inlays, three-position pickup toggle switch, anchored Adjusto-Matic bridge and Gretsch “V”stoptail, “G-Arrow" knobs, white pearloid pickguard with Gretsch logo and threaded/knurled strap buttons. Case sold separately.